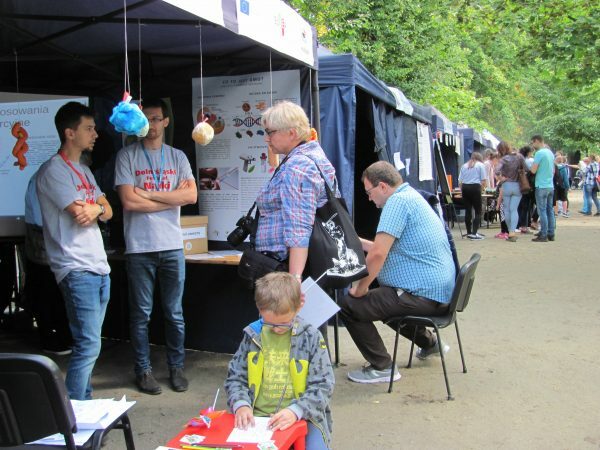 In September 2018 the University of Wroclaw organised and hosted a Mobile Nucleus during the “Park of Knowledge” during the 21st Lower Silesian Science Festival (LSSF). Park of Knowledge is a set of stands located along the popular Wroclaw Promenade, making it a perfect spot for a Mobile Nucleus. 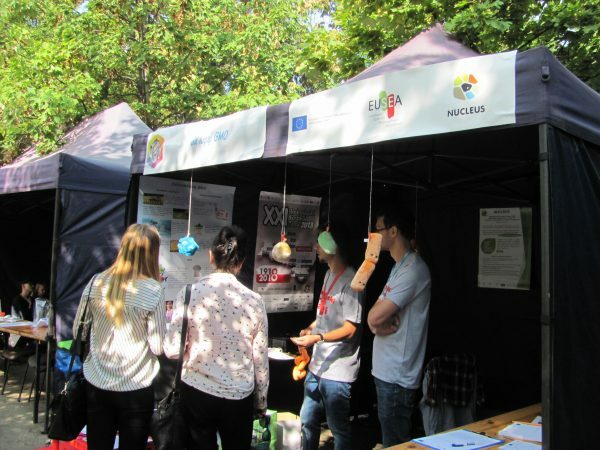 The Polish title of the Mobile Nucleus organized in Wroclaw was “Pod lupą: GMO” which can be translated as “GMO under the magnifying glass”. The objective of the Mobile Nucleus was to listen to people’s opinions, expectations and fears related to GMO’s. The installation was a very convenient format to collect this feedback because it enabled people to gather, while encouraging participation. It also provided a space for scientists from diverse fields such as biotechnology, microbiology, immunology and experimental therapy to engage with the public and start a discussion about the co-responsibility of research. This Mobile Nucleus reinforced a strong public interest in discussing controversial topics such as GMO’s, and that there is a public interest in influencing policy makers. With more than 200 participants, most of the visitors were eager to ask questions and discuss the topic with the researchers. Our partners from the University of Wroclaw state that this event confirms the importance of public engagement and at the moment they are analyzing the collected data from the 118 filled questionnaires. If you want to get in contact with the team, drop them a line here.